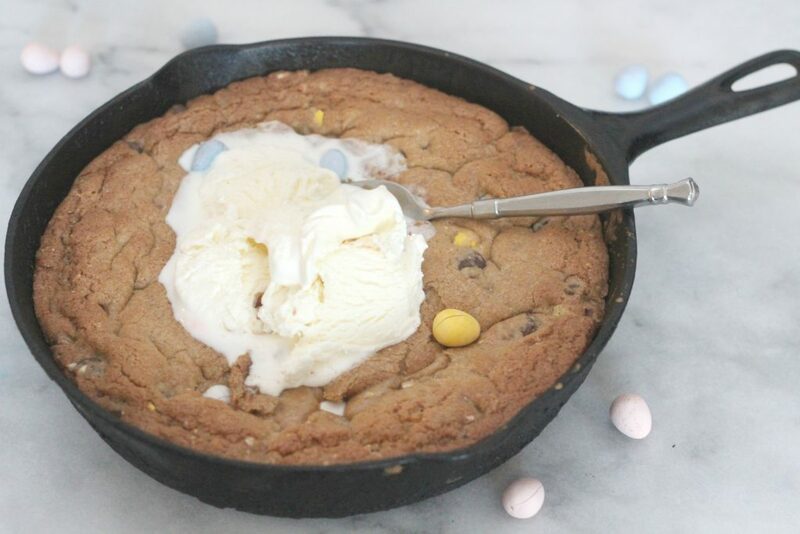 This deep dish chocolate chip cookie with Cadbury Mini Eggs is a heavenly Easter treat. Topped with vanilla ice cream and served warm, it’s a dessert everyone will love! If you ask me what my favorite candy is my response will be Easter. Yep, I’m a sucker for Easter candy…all of it. You don’t like Peeps? Perfect! Bring them to me. Those colorful marshmallow eggs with the candy shell that don’t taste anything like marshmallows? They are amazing. Heck, I even love those bags of black, licorice flavored jelly beans. But the Holy Grail all Easter candy has to be anything from Cadbury. I dream of Cadbury Creme Eggs all year long. (Do you think these Cadbury Eggs from the UK taste even better? I need to find out.) I stash them in the back of the fridge, hoping that no one will find them so in August I have enjoy my moment of weakness. But those Cadbury Mini Eggs make me melt. The milk chocolate has a slight malty taste and the candy shell is perfectly crisp. 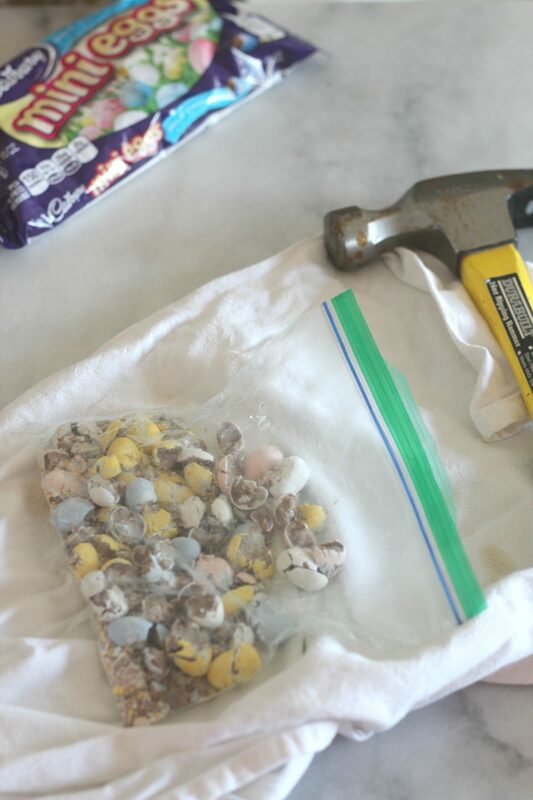 My favorite part of making the Deep Dish Chocolate Mini Egg Cookie was taking a hammer to break up the Mini Eggs. Destruction is fun! I found it worked best to put the candy into a Ziplock bag and then wrap the bag in a dish towel before hammering. I love taking out my aggressions on chocolate! This recipe can easily be halved. I used a 9 inch cast iron pan (get one from Amazon! )but feel free to halve the recipe and use a smaller dish. Baking times may need to be adjusted. Preheat oven to 350F. In a large bowl, cream butter and sugar together. 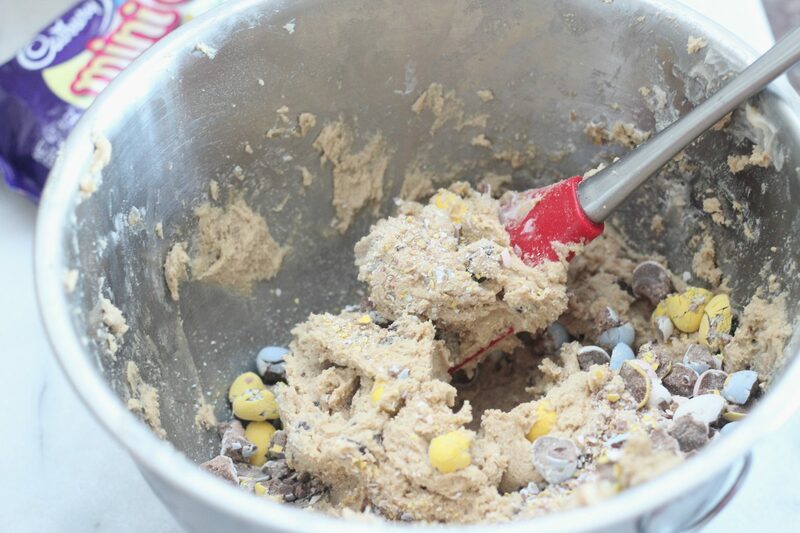 Stir in chocolate chips and Mini Eggs. 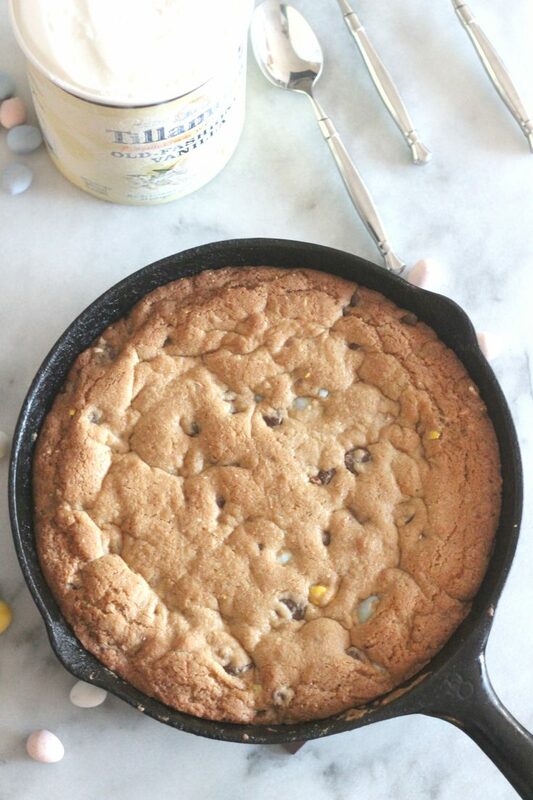 Grease a 9 in cast iron skillet or 9 pie pan. Bake for 22- 24 minutes. Center of cookie will appear slightly gooey. 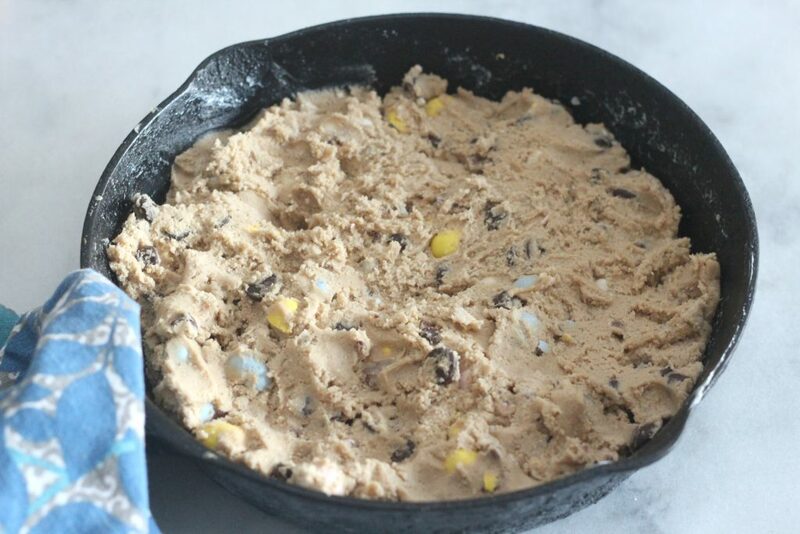 Of course this deep dish chocolate chip cookie recipes is great for more than just Easter. Skip the Mini Eggs and eat this for dinner in September. I mean dessert, eat it for dessert. No I didn’t. Looks good! I guess tools aren’t only meant for home stuff. Lol It works in baking too. My girls would love m&ms in this. Looks delicious! 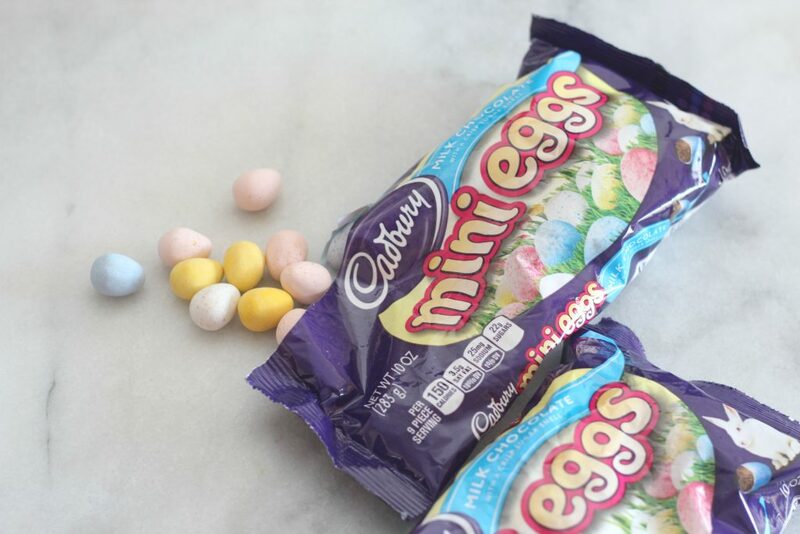 I love the mini eggs and was thrilled to find dark chocolate ones this year as well as the reg. chocolate ones. Pinned. This looks delicious! Just perfect for Easter. OOOhhh – I think I’d eat the whole thing by myself! Thanks for sharing at the What’s for Dinner party! What a neat idea! I love that you put eggs in it to make itfestive! How yummy is this? Thanks for sharing with SYC. Yum ! Thanks for sharing at Home Sweet Home. 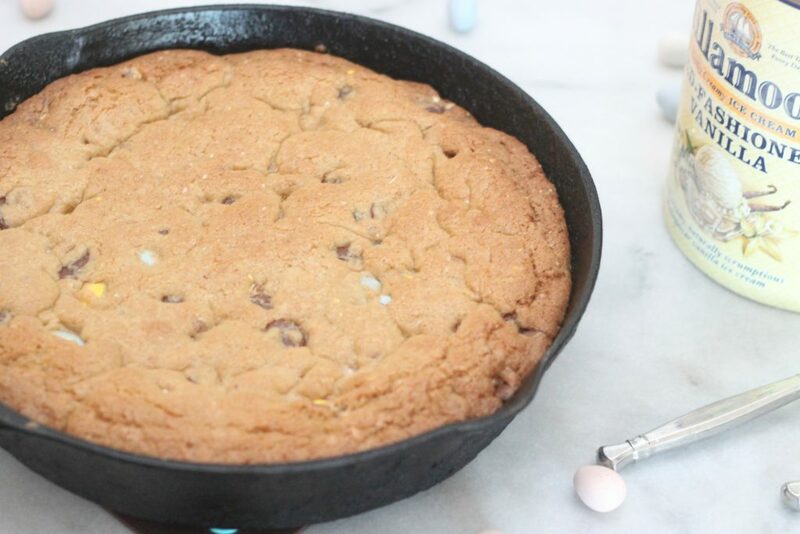 Great way to use my cast iron skillet, great looking cookie! !